Although history has been clouded by fiction, St. Patrick was believed to be British and born to wealthy parents near the end of the fourth century. At the age of sixteen, he was taken away from his family by Irish raiders attacking his family estate. During his captivity, he served as a shepherd in County Mayo where legends have said that he was being held. There in his loneliness and fear of his fate, he turned to religion for solace, becoming a devout Christian. After more than six years of imprisonment, Patrick escaped with the help of Divine Providence. God spoke to him in a dream, guiding him to his way back to Britain. After escaping, he went back to his family and studied for priesthood. Not long after that, he recieved another dream – an angel telling him to return to Ireland to preach the Gospel. He heeded the call and returned to the land where he was once prisoner as a missionary to guide the people to the Christian Faith. 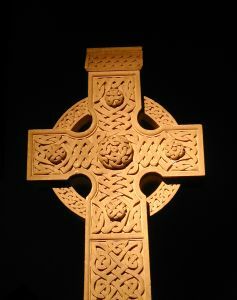 St. Patrick made the Celtic cross, adding a sun to the cross, incorporating the Irish belief in Celtic culture. The sun was believed to be a powerful symbol of fire which was used to honor their religion. He even used bonfires to celebrate Easter. As people do with their beloved and honored kin, the Irish spread the story of St. Patrick, the exciting yet confusing mix of truth and fiction. According to one of these accounts, St. Patrick once stood on a hilltop (which is now called Croagh Patrick), and with only a wooden staff by his side, banished all the snakes from Ireland.belief in Celtic culture. The sun was believed to be a powerful symbol of fire which was used to honor their religion. He even used bonfires to celebrate Easter. St. Patrick’s Day is celebrated on March 17th, which is believed to be the day of his death in the fifth century. 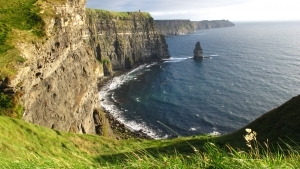 For over a thousand years, the Irish people have observed this day as a religious holiday. Irish families traditionally attend church in the morning and celebrate in the afternoon. Even if St. Patrick’s Day falls during the Christian season of Lent, Lenten prohibitions against the consumption of meat are waived and people dance, drink and feast–on the traditional meal of Irish bacon and cabbage. With all these things, people have to bear in mind that St. Patrick’s Day is not just a holiday, it is a celebration of traditions and beliefs brought about by a history of the Irish people and the man who kindled the fire of Christianity in their hearts. More than a holiday to be celebrated annually, it is a commemoration of life.